Bed bugs are the summer vacation souvenir that none of us want to bring home. But picking them up is a risk when you’re sleeping anywhere outside your home. Bed bugs spread by hitching a ride on luggage, clothing and infested furniture or bedding, and they’re small enough that you can carry them home on these items undetected. 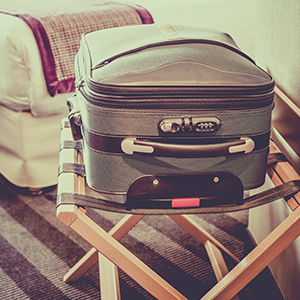 Taking some precautions when you get to your hotel and return home again can help keep you from inviting bed bugs to stay. Examine the bed sheets and mattress seams for signs of bed bugs (most commonly dark stains or rust-colored spots), paying close attention to the head of the bed. Carry a small flashlight with you to search more thoroughly. Store your luggage off the floor using a luggage stand or tabletop. If you are highly suspicious, search around bed bug hot spots, such as desks and chairs; behind wallpaper, clocks and pictures; cracks in wood floors; and under the edge of the carpet. If you identify bedbugs in your hotel room, change rooms immediately or change hotels entirely. Before leaving the hotel, pack all your clothes in disposable plastic bags so you can immediately wash them when you get home to kill any bed bugs that might be nestled in the clothing. Immediately wash your clothes. Set the washer and dryer on the hottest cycle the fabric can withstand. Inspect your suitcases and other items that aren't machine washable. Scrub with hot, soapy water (100 degrees to 120 degrees) along all the seams and folds. Follow manufacturer recommendations for cleaning. If you have brought bed bugs home with you this summer, spray bed frames, mattresses, suitcases and more with EcoLogic® Bed Bug Killer Aerosol, a formula made with botanical lemongrass oil that’s safe for use around children and pets when used as directed. Vacuum often and keep clutter removed from areas where you’ve seen bed bug activity. Inspect the area and repeat after two weeks while bed bugs are still present.